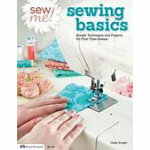 This is the perfect book for anyone who wants to learn how to sew, or just needs a quick refresher course. Friendly and easytofollow directions will have you sewing with confidence, making repairs, and creating new garments from scratch. From cutting patterns and sewing seams to binding edges, gathering fabric and installing zippers, each new skill is accompanied by a quick practice exercise to try, allowing you to learn as you sew. 36 simple and straightforward projects are provided.